When visiting Blue Mountain Lake, NY, last week, we visited the Adirondack Museum, one of the largest museums in Upstate New York. It took us two days to get through! 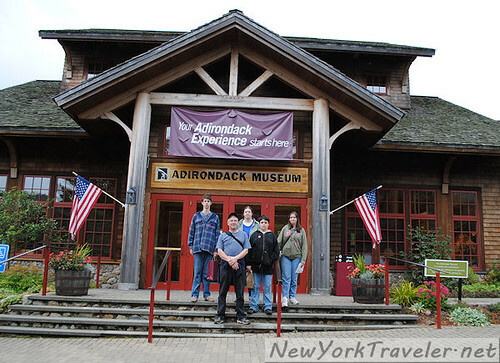 There, we learned just about everything there is to know about the Adirondack Park region. The museum had a section dedicated to Lake Placid, a small village in the northern area of the park. Do you remember Lake Placid? The tiny town held the Winter Olympics (in 1932 and 1980). I remember watching the Olympics as a young lady– I am not fond of spectator sports but I love watching the Winter Olympics. I used to watch every figure skating and speed skating competition that I could. How disappointing it was to have to go to school and miss some of the competitions! This week, I have done a little digging into the games. I found a nice DVD on the history of Lake Placid (“Small Town, Big Dreams” by PBS) and found scads of video clips online of some of my favorite skaters. My son and I watched Scott Hamilton clips for over an hour last night! I always liked Scott Hamilton. He was such an exuberant skater with a touch of humor and goofiness. We found this video of Hamilton and Kurt Browning (another very entertaining skater) and LOVED IT! I don’t often post videos here, but this one is really worth watching. The final 3 minutes are hilarious and the skating is nothing short of stunning. Enjoy! I also found this video. It’s of Kurt Browning (a much younger man here) skating to Singing in the Rain. WOW!!! Scott Hamilton certainly was a delight to see on skates. You have described him well. Gerard used to like watching figure skating a lot; hasn’t recently though. We both liked watching Scott Hamilton.